The sketch is from Jen del Muro. I stamped Pumpkin Lala in Papertrey's Dark Chocolate ink and then did a little coloring with a dark brown Prismacolor colored pencil and just a tiny bit of odorless mineral spirits. I colored in the pupil entirely so I just dotted back in the highlights with a white Inkssentials pen. The flower was cut with a Cuttlebug die from the polka dot patterned paper, cut with scissors to open up the petals a little, and then the petals were rounded a bit with a stylus. To keep the rounded part from flattening, I glued three 1/8" hole punches behind each petal. I dyed a light brown Prima flower with Dark Chocolate ink to match and the sentiment from Verve (Hello Pumpkin set) was also stamped in Dark Chocolate. Final touches: I embossed the circular piece with the Cuttlebug Birds and Swirls folder, distressed the edges of the square and circle pieces, added a scalloped border with hand sewn cream seed beads, tied a button to the center of the flowers with crochet thread, and pierced each of the top corners. I hope you like it! We'd love for you to play along! All the details can be found on the La-La Land Crafts Blog. TFL! I added Stardust glitter pen to all the dots of her hat and dress, her belt buckle, and also to the black streaks in her hair, and a bow made of silver cord to her hat. 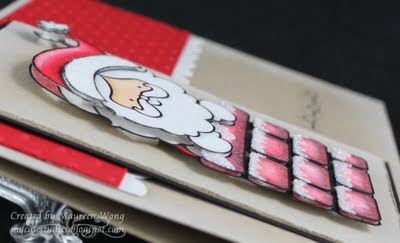 The paper strip was punched on both sides with a Martha Stewart border punch and the velvet ric-rac is from May Arts. Lastly I used glitter alpha stickers from Making Memories and a beaded hanging charm. All patterned paper is Basic Grey Eerie. I hope you like it and TFL! 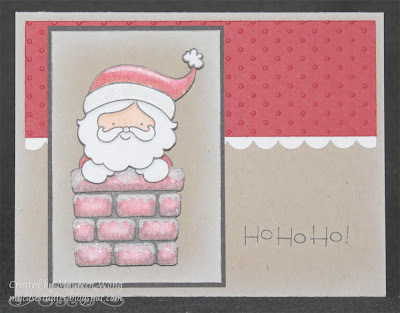 First up today I'm excited to announce the winner of my card giveaway from the Your Next Stamp Blog Hop! I just wanted to thank everybody for stopping by my blog and for all of your wonderful comments!! Reading all your sweet words about my cards really brought a huge smile to my face and makes stamping just that much more enjoyable!! Anyway, on to the winner!! Congrats Jodi!! Please email me (link is in the sidebar) with your mailing address and your choice of card from my blog hop creations and I'll get that right out to you! Thanks again everybody - it was such a fun hop and we hope you'll all join us again for the next one!! I used Squirt who is one of my fave DF characters because he's so cute! I did just a bit of coloring with Copics then cut him out and popped him up on foam boosters. I die cut the Quickutz letters 3 times each and glued them together so they'd have some dimension also, and lastly I added Bella's Baubles to the bottom right corner. The patterned paper is all from Sassafras Lass. I hope you like it and TFL! Lastly I added some Stickles to the candles on the patterned paper and the candle flame in the image, glitter chipboard Thickers, and a bit of May Arts ribbon. As soon as I looked at this outfit, I thought it was meant to be pajamas, but I saw a clown costume! Our design element this week is "about you" which means our favorite colors, techniques, etc.. My fave techniques are paper piecing, cutting out images and popping them up, sewing on my cards, and lightly distressing the edges of panels. I also used a fave embellishment (ribbon) and coloring medium (Copics). Little details: I added a 1/8" hole punch for his clown nose and flocked the little top of his hat! I used a Limelight sketch (I know it's late, but I really liked the sketch so I used it anyway! ), and also met the requirements for the Kaboodle Doodles Challenge #14 - 1 solid cardstock, 2 patterned papers, 3 embellishments, and use a digital image. This challenge is being sponsored by Softpencil so I had to play! I hope you like it and TFL! Other materials used: patterned paper - My Mind's Eye; sentiment - Your Next Stamp (Happy Days Mermaid set). If you're looking for the Your Next Stamp blog hop, it's the post directly below this one! Thanks! Yay! It's time for another La-La's Weekly Wednesday Challenge! Before I get to this week's challenge, I'd like to thank everybody who played in the Embellish It! challenge last week! The entries were all fabulous and I really enjoyed seeing everyone's take on my theme! Congratulations to the Top 3! The moon was cut with a circle Nestability and lightly chalked with a little color around the edges. I added a lot of zig-zag stitching, silvery-purple May Arts ribbon, and glitter chipboard Thickers. I hope you like it! We'd love to have you play along! All the details can be found on the La-La Land Crafts Blog. Don't forget that there is a shipping special at La-La Land Crafts for the month of September - US orders of $50 or more get free shipping and international orders get a shipping discount. Here's a link to the store! TFL! Hi everybody! 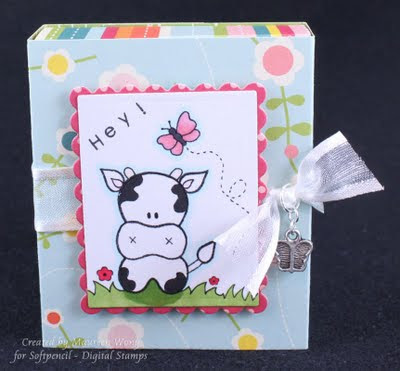 Thanks so much for joining us for the very first Your Next Stamp Blog Hop! Your Next Stamp has a whole bunch of Fall, Halloween and Christmas stamps that were just released so the Starlets have whipped up some yummy eye candy for you using many of the new stamps! If you didn't start at Karen's blog and work your way here, you'll definitely want to go back: If you comment at every stop on the hop, you'll be entered to win the grand prize of $50 of stamps - winner's choice, along with free shipping! We also have a "mystery" blog where one commenter will win a stamp set of their choice (with free shipping), but we're not telling you which blog it is! And, if that's not enough yet, each of the Starlets will be giving away one of their hop projects to a random commenter at their blog! One last thing to mention before I get to my cards: Karen is offering FREE shipping until Thursday, September 24 at midnight EST so you can go shopping for the new releases (which are all available now), as well as any previous stamps that you can’t live without and/or other products carried in the store! The coupon code is PARTY. And now, without any further ado, on to the show! I used the set Yummy Pie which came with the pie image and the Thanksgiving sentiment. Both were stamped in Dark Chocolate ink and then I did some very simple coloring with Prismacolor colored pencils. Blending was just done with the pencils themselves, no odorless mineral spirits! I added a bit of patterned paper from the DCWV Rustic stack punched with a Martha Stewart border punch, and then a piece of ribbon. I did some crazy straight stitching all around the outside, then added a little trim and foam Thickers letters that I covered with Stickles. I added more Stickles to the snowflakes in the patterned paper, which is from Imaginisce (I used one sheet of double-sided paper called Comfy Cozy), and finally I added the focal panel with foam boosters. I used the set Windswept Fhiona which comes with a sentiment and a bunch of little images like the mushrooms. I used a sketch from Mercy's Tuesday Sketch Challenge (yes, I just finished this card today!) and 5 different papers from Basic Grey's Mellow line. I added a torn piece of patterned paper for the ground, some Prima bling for the wind and a piece of ribbon. I seem to be a little obsessed with distressing lately - almost all my cards have at least one piece where I roughed up the edges with my scissors and these three cards are no different! All of them have distressed edges on at least one layer; the third card has distressing on every layer! So they all qualify for the Cupcake Craft Challenge which is distressing. The third card also qualifies for the My Time To Craft Challenge which is Autumn Fest. Some final info before you go: If you join our Yahoo Group before October 1st, you'll be entered to win a $20 stamp shopping spree at Your Next Stamp! Our challenges will be starting on October 7 on the new YNS Challenge Blog. There are a couple stamp sets you can win and you'll find all the details here-> YNS Challenge Blog. Whew! That’s all for now - I hope you liked my cards and thanks for visiting! Your next stop on the hop is the amazingly talented Stephanie! Fishy Wishes and Sneak Peek! I used the completely adorable Happy Days Mermaid set, which I fell in love with as soon as I saw it!!! I colored her with Copics, cut her out, then added an extra flower and shells popped up with scrap cardstock. I also added a few Swarovski crystals for a little bling and finally she's popped up on extra thick foam tape. I used a sketch from Card Positioning Systems which I altered just a bit by turned it on its side and making it a square instead of a long rectangle. There was a wavy element on each side of the sketch and so I decided to sew ribbon to each side, scrunching it up to make it look like seaweed. It took forever (manually cranking each stitch and re-doing it a couple times), but I really love how they turned out! The background was airbrushed and I stamped the little bubbles all over then went over each bubble with a clear Spica glitter pen. The final touches were a sentiment and the starfish from the same set. We'll be having the first Your Next Stamp huge new release blog hop on September 23 starting at 3 a.m. EST, which is actually September 22 at 9 p.m. Hawaii time. YNS will be releasing Fall, Halloween and Christmas stamps and they will be available on that same day. The best part (besides all the fabulous DT eye candy that we'll be presenting!) is there will be 2 prizes: a mini prize of one stamp set and a grand prize of $50 of stamps, both winner's choice with free shipping! One last thing before I go - YNS now has a challenge blog! Our challenges will start on October 7, but you can enter to win a prize before then - check it out here! Thanks for visiting today! I know that *technically* this is called a box, but to me it looks like a bag with a folded over top, so hopefully I still met the challenge! 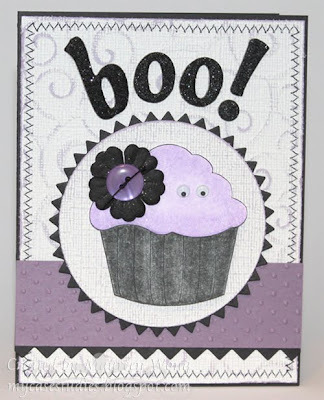 I used black and purple cardstock for the base and zig-zag stitched on some distressed patterned paper from the new Basic Grey Eerie paper pad (BTW, this stuff really is eerie/scary - not cute at all!). The little witch was colored with a combo of Copics and a little colored pencil for highlights and shading. This is for the Copic Creations challenge which is to combine the 2 coloring mediums. I think I prefer the white colored pencil for highlighting rather than the Inkssentials pen - it's a lot less harsh so I don't have to smudge it with my finger to tone it down. Lastly I added some ribbon with a charm to keep it shut. Before I go, I have some Softpencil news to share with you: Softpencil now has groups on AiFactory and Paper Craft Planet! We'd love for you to come and join us! You can chat with the owner and illustrator of Softpencil, Elizabeth, as well as our DT and other fans of Softpencil! Also, starting in October we'll be having our own challenges in our group at Paper Craft Planet! 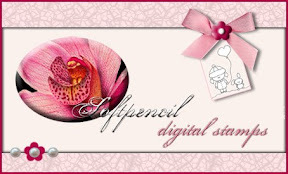 If you don't have any Softpencil images yet, don't worry - there are freebies available: Pinky's home, Calla Lily, and sky and grass digi paper. There will be prizes, so we hope you'll come and play with us! TFL! Wednesday is here so that means it's time for another La-La's Weekly Wednesday Challenge! But it's not just any challenge because this week is my turn to host! I love to embellish my cards so I decided on the theme "Embellish It!" Please use at least 3 different types of embellishments on your projects this week. 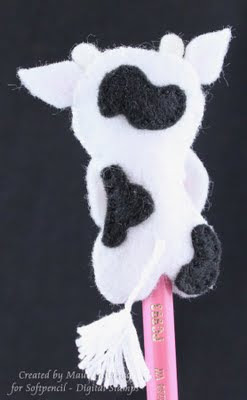 They can be anything - buttons, ribbon, charms, brads, flowers, glitter, etc., as long as you've got 3 different types! I hope you have fun with this challenge! I used sketch #5 from Get Sketchy and this card also qualifies for the Lili of the Valley challenge - use the colors green, brown and orange. We hope you'll play along with us this week! All the details can be found at the La-La Land Crafts blog. TFL! I colored the cupcake with colored pencils and odorless mineral spirits. I used Core'dinations whitewash cardstock and some glitter Thickers alphas. Isn’t she just the cutest?! I colored her with Copics, cut her out and mounted her with foam boosters. For a little extra something special, I added a couple Prima flowers with a Swarovski crystal to her headband. The papers are from Basic Grey (Lemonade is one of my fave collections they’ve ever made!) and the ribbon is from My Favorite Things. I also wanted to let you know that Sketchy Thursday is celebrating one year of sketches and you can win a $52 stampy shopping spree!! The only catch is that she needs at least 52 entries to give away the prize, but you are allowed to enter multiple times so why don't you play along? Click here for all the details! ABC Challenge - "D is for Diecuts"
There is a SECRET sale going on right now! Sign up for the newsletter through the store to find all about it! It runs until Monday, Sept. 14, so hurry! We've got a Yahoo group where you can chat with the YNS Starlets (that's our new name for the DT!!) and other fans of YNS. If you sign up before October 1st and introduce yourself in the group, you'll be entered to win a $20 gift certificate to the store! Once you join, you can also sign up for our card swap. Click HERE to join! There's a fun guessing game on the YNS blog where you can win an upcoming stamp set and a $10 gift certificate to the store! Click HERE for your chance to win! Last, but certainly not least, mark your calendars for our very first YNS New Release Blog Hop happening on September 23rd. We'll have more details for you later! Whew! That’s all for now! I hope you like my card and TFL! I used three different coloring mediums for this card – Copic (skin), chalk (tree top, sky, grass), and colored pencils blended with odorless mineral spirits (everything else). I’m really happy with the way it came out and think they all match very well. I think I have a little bit of a seed bead obsession as I’ve sewed them onto this card as well. There were tiny little circles in the tree top so I decided to bead each one. I liked the red for little pops of color, but there were too many so I mixed in green ones to tone it down. This card is also for the Digital Tuesday Challenge - make a project using a teen/child/baby digi image. Finished card is 4.25” square. I like this size square card because it still fits into an A2 size envelope. I hope you like it and TFL! BTW – don’t forget to hop around to the other DT members’ blogs to see what they’ve done with this image! Thank you both so much - you are so sweet to think of me!! Other materials used: patterned paper – My Mind’s Eye; cream cardstock – Bazzill; sentiment – There She Goes (Dream Big set); Nestabilities. I tore myself away from my Lalas this week to play with Rosie with Bird. I also got out my Prismacolor colored pencils and odorless mineral spirits because I thought this type of coloring would match nicely with the challenge and the papers I chose, which are from the new DCWV Rustic stack. I did use my trusty Copics for her face, arms and legs though because I really like these skin tones. 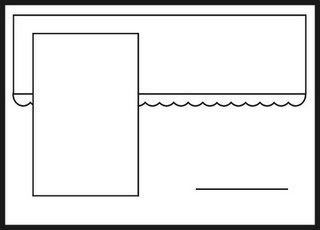 For the image panel, I traced the inside of the Nestabilities die with a pencil and cut it out so that it would be slightly smaller than the actual die cut version of the same die (so I would have the perfect mat), then stamped and colored. Next I inked around the outside with Antique Linen distressing ink and ran my scissor blade over the edges. I also ran my scissor blade over the patterned papers, and inked them a little too. Final details – I hand sewed some DMC flower thread on the flower strip and then sewed cream beads all over the diamond paper, added some May Arts ribbon and a charm, stuck the image on with foam boosters and I was done! I left out the sentiment so I can use this card for any occasion. This card was also made for the Secret Crafter Saturday Challenge - Hearts and Flowers. I hope you’ll play along with us this week! You can check out all the details at the La-La Land Crafts blog. Also, I wanted to let you know that the new La-La Land Crafts Halloween stamps are available for purchase. You can find them all in the New section. And for the month of September, U.S. orders of $50 or more receive FREE shipping! International orders will receive a shipping discount! So it's a great time to treat yourself to some La-La Land Crafts stamps! TFL! I used one of my favorite Sugar Nellie images, Just a Girl and some Basic Grey Lemonade papers. Her dress and shoes were paper pieced and colored just a bit with Copics, as was the rest of her. I cut her out and popped her up with foam boosters. I did some machine sewing and added a bunch of 'bellies to finish it off. I hope you like it and TFL! I saw the design in the Firemountain Gems gallery and thought it was so adorable that I had to order all the pieces and make my own! I had a great time with this challenge and hope you'll join in too! Thanks very much to the gang at Tuesday Taggers for having me a guest designer! I hope you like it and TFL! Other materials used: patterned paper - Cosmo Cricket; pink cardstock - Bazzill; rub-on - Basic Grey; ribbon - May Arts; chipboard arrow and Swarovski crystals from stash. Santa was printed multiple times on white cardstock and colored with Prismacolor colored pencils and odorless mineral spirits, except for his face, which I colored with Copics. I flocked the brim and pom on his hat (which is for 365 Cards - use felt or flocking) and added glitter "snow" to the bricks in the chimney. I kept the card really simple to keep focus on Santa. Each brick was cut out and popped up with 2 layers of scrap cardstock. 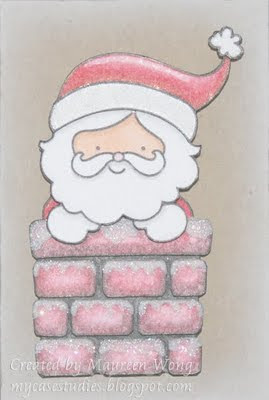 Santa was popped with foam dots and the flocked bits were popped up with scrap cardstock. I hope you like it and TFL! Other materials used: kraft cardstock and Fresh Snow ink - Papertrey Ink; red and black cardstock and border punch; rub-on sentiment - Making Memories; Swiss Dot embossing folder - Cuttlebug. 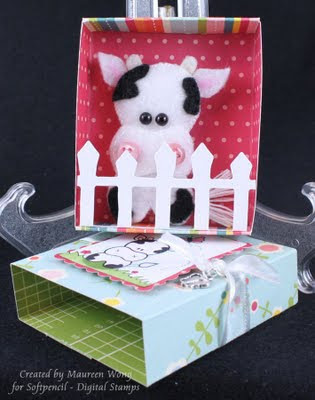 Little Cow Box and Surprise! Lastly - I glued on 2 black half pearls for the eyes and poked a tiny bit of stuffing in the head for some shape. I hope you like my box and pencil topper and maybe you'll be inspired to make your own felt creation using a digi image as a pattern! P.S. I also wanted to mention that it was my hubby who suggested having a fence inside the box so I added the Sizzix diecut and it was perfect! Thanks Honey! Your Next Stamp News and Sale!